Club Bamboo South unit 224, Gulf Front Studio, ocean view, maximum occupancy of 4 people. Community pool, community BBQ grill. Beautiful Gulf Front Studio directly on the Gulf of Mexico! Open the sliding glass doors to the covered private balcony and listen to the sound of the surf. Enjoy your day pool or beach side. This property does have a onsite office for your convenience. Furnished with a king size bed, love seat and ottoman (both are twin Pull outs) dining table, Tv, and internet. Kitchenette with microwave, coffee maker, full size refrigerator, 2 burner cook top, and toaster. This property does have a large swimming pool and lounge area, that lead you straight to the beach. There are two community charcoal grills(charcoal not provided) on property with sitting areas. The free Island Trolley is ready to take you to the north end of the island to visit the village of Anna Maria, where two historic piers offer opportunities for fishing and dinning. Shops restaurants, galleries, and even a museum and community theater can also be found on the north end of the island. Rentals are available for bikes, kayaks, jet ski's, boats, beach chairs and umbrellas. Every Island attraction is right at your fingertips during your stay here. Whether you want to sink your toes in the soft white sands on the beach, or pause to watch the sunset over the tranquil Gulf of Mexico. 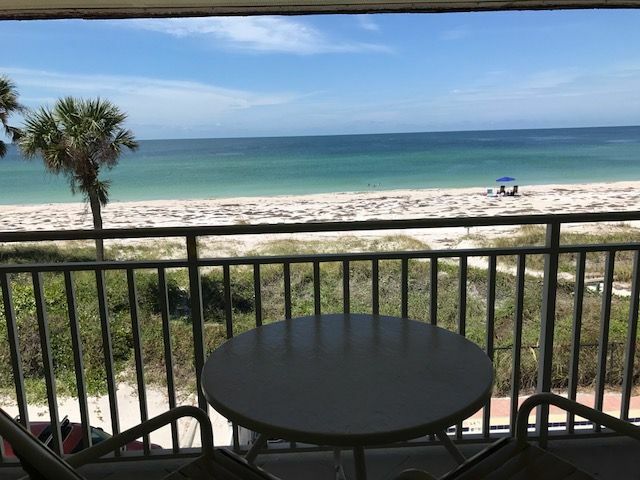 Come and experience for yourself why Anna Maria Island is considered Florida's hidden Paradise! Property is clean and nicely furnished tho the addition of a luggage rack, coffee table and a lamp that you could read by would be an asset. Security lock on door is broken and unusable. Service fee is charged, but you have to empty your own trash under penalty of $20 fine. Bring your own soap! Loved our stay on Bradenton Beach and Ana Marie Island. The picture is the view from your private balcony with perfect view of sunsets every night. It is on the second floor, and there is an elevator. You are steps away from the beach and can walk for miles on the beach where seashells are abundant. We were lucky enough to see a dolphin swim by a couple mornings. There is also a trolley stop one block from your studio that has stops from one end of Anna Marie Island to the other, and there is no charge. Awesome place! The view is awesome, quite area and an overall wonderful experience. Clean, great service and awesome view and facilities. Already booked for next year! Such a great little studio to stay in on the beach! Great pool, friendly staff and clean grounds. I will be staying there in the future.